Football is finally back in full force as the NFL kicked off last night. It’s great to have a packed weekend of games. Let’s get to the games! Opening night of the NFL season featured a Super Bowl rematch that went to the wire. The Panthers missed a FG at the end and dropped a 21-20 game to the Broncos. Back to back losses to the same team has to sting. Unfortunately this Sunday is marred by change at QB for three contenders. Tom Brady starts his four game suspension, Tony Romo (Cowboys) and Teddy Bridgewater (Vikings) are injured and out. For the Cowboys, what looked to be a promising season ahead is now in the hands of two rookies, Dak Prescott at QB and Ezekiel Elliot at RB. Elliot should get a lot of touches to help take the pressure off of Prescott at QB. The Cowboys were considered a contender with Romo, can they still find a way to the playoffs without him this season? For the Vikings, a huge blow. Their young QB who’d taken them to the playoffs last year is out for the entire season. The team looked ready to make a run at another playoff birth until the injury to Bridgewater happened. They’ve traded for Sam Bradford but how quickly can he adapt to Minnesota? I think they’ve still got a shot at a wildcard but they’re gonna need the defense to keep them in every game this season. Patriots at Cardinals – How does Carson Palmer rebound from a disastrous NFC Championship game? Everyone will be glued to this game to see how the Brady-less Pats do on the road against a playoff team. This is the must see game of the week. Giants at Cowboys – They usually always seem to have great games in Dallas. With a rookie backfield, this will be must watch TV. Could see legends in the making or another great disappointment for Cowboy fans. Packers at Jaguars – I think the Jaguars will be much better than they’ve been in years. The Pack welcome Jordy Nelson back so look for he and Rodgers to connect for at least one TD on Sunday. I think the Jags keep this close throughout and have a good chance at the upset. If you want to get an email for next week’s NFL pick ’em contest sign up below. If you haven’t check it out yet, read our 2016 NFL Preview and get all of our predictions for the 2016 NFL season. 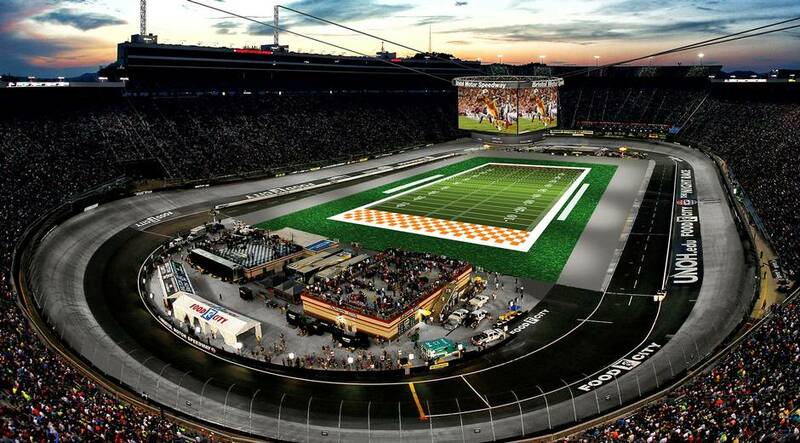 Virginia Tech vs. Tennessee – This game is expected to have 150,000 people at it as they play at Bristol Motor Speedway. Just the optics of seeing a football game being played at a speedway in front of that number of people will be worth tuning in for on Saturday night (8 PM ET on ABC). Tennessee has been here all week how it struggled with Appalachian State last Thursday so it has something to prove on the national stage Saturday night. Western Kentucky at Alabama – Alabama just ran over USC in week 1. It was a dominate performance from the Crimson Tide. Now they get a good Hilltopper team. I’m not watching because I think Western Kentucky can pull the upset, but can they hang around. We predict ‘Bama by 30 but I’m interested to see if their offense can put some points on the Tide’s defense. Arkansas at TCU – Both teams won in week 1 but were unimpressive in doing so. This is a big game for the SEC and Big 12. Each conference needs a non-conference win after they got beat up last week. I think Bret Bielema finds a way to take this one deep in the fourth quarter and have his team in position to get a win on the road. There’s still time to enter for our week 2 college football pick ’em contest. It’s Free Formulator week, 7 days of free picks in the SportsFormulator Pick Shop. Get this week’s 7 free college football and 5 free NFL picks in the shop.